Early in my self-education about photography, I learned that the camera should be set for high-speed to capture the stillness of action unless, of course, the intent is to purposely blur a subject blurred. In today’s assignment, I learned that blurring is OK and sometimes desirable. The Ocoee Whitewater Center in Copperhill, Tennessee was built for the 1996 World Olympics held in Atlanta, Georgia. 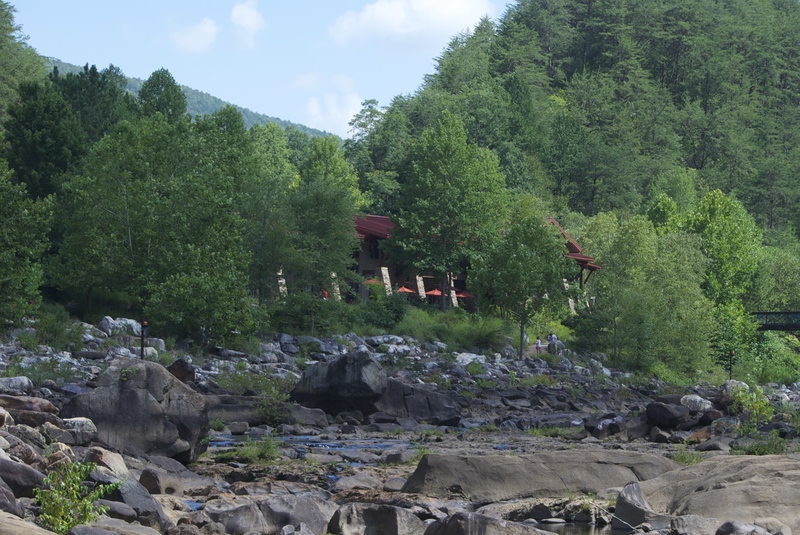 Nestled on a sleepy river deep in a rocky gorge, in the Cherokee National Forest, the Ocoee river was modified to provide some of the best white water rapids found anywhere. 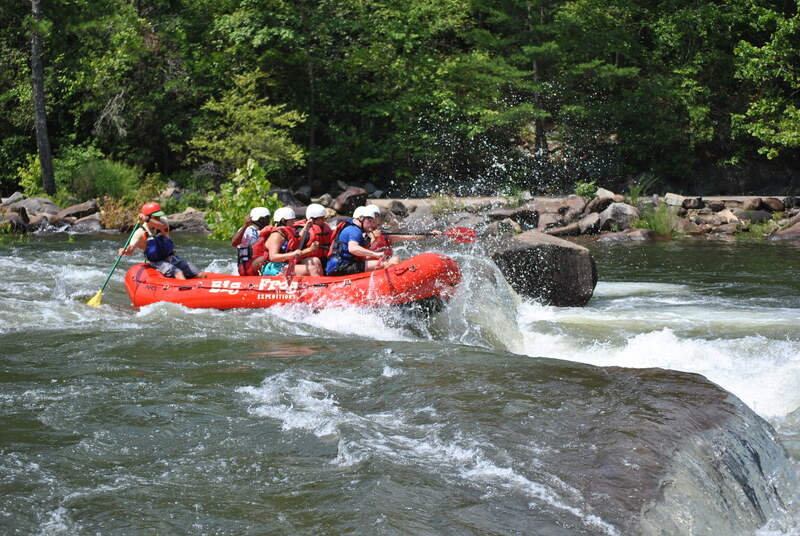 Water releases from upstream dams are managed by the Tennessee River Valley Authority and are scheduled through the summer to provide turbulent water flow for thrill seekers and flood control. When the water is held back, the rocky bottom provides pools of fresh, cool water for sun bathers. Then the alarms go off warning people downstream that the quiet rocky bed would soon become a raging river with whitewater that will flip many experienced kayaks or professionally control river rafts. This is just a perfect setting for today’s assignment. We no longer live in that area and water releases are not scheduled until April. The photos presented are from our visit to this are in 2012. I am standing downstream of the water flow – obviously before the water was released from the upstream dam. Notice the large boulders on the left and center of this image. Water is channeled between these two boulders. The professional river guide, in the rear of the raft, steers between the two boulders. A kayaker is in control of his own destiny. I can say he demonstrated exceptional navigation techniques on his approach to this spot. There are no white water rapids near my current location and the rain today is keeping most adventure seekers indoors. I look forward to finding locations similar to this where I can apply today’s theme. Thanks for stopping by, y’all come back now. 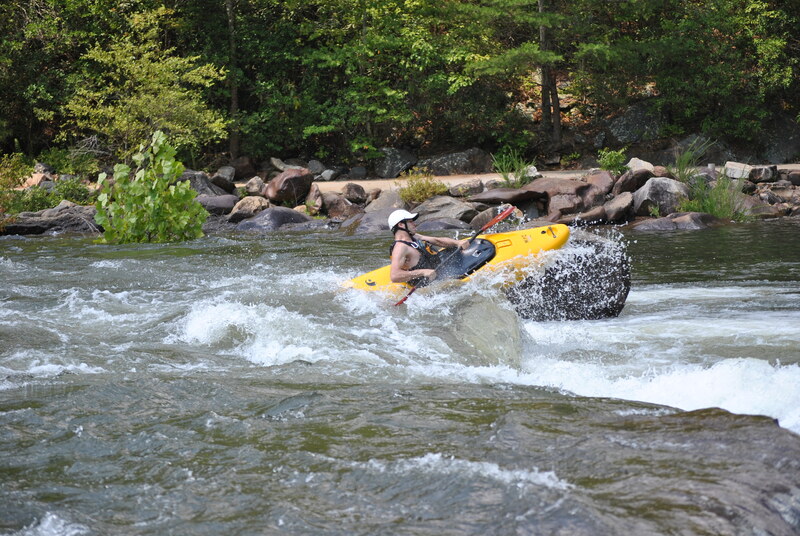 This entry was posted in Photography, Tennessee and tagged Copperhill, Ocoee river, Ocoee Whitewater Center, Photo101. Bookmark the permalink.